Bhopal was a former state, South Central India States, India; 6,921 square miles; incorporated 1956 in Madhya Pradesh. Chief state of former Bhopal Agency and next to Hyderabad the most important Muslim state in India. Surface broken by Vindhya Mts; Narmada River formed its southern border. Founded 1723 by Dost Mohammed Khan, an Afghan chieftain who had served under Aurangzeb; made treaty arrangements with British government 1817; ruled by female line (Begums of Bhopal) 1844-1926. 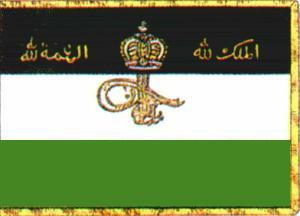 The Begum of Bhopal has a rectangular tricolor standard black - white - green in horizontal stripes of equal length with a yellow fringe ... with a silver crown on the top stripe ... Arab ideograms in gold, on the middle stripe the "Tughra" in gold (the tughra is the signature of the Muslim Sovereigns; it appears too on the standards <and stamps> of the Ottoman sultans and the Afghan king). On top of the flag mast the coat of arms in gold. image located by Jarig Bakker, from Ziggiotto (1998).